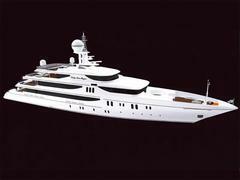 Lady Ann Magee II, the 65m Codecasa superyacht due for launch in August 2010 has been sold. Although she was a joint central agency with Edmiston, Yachting Partners International and Camper & Nicholsons International asking €47 million, I'm told that she was sold in a direct deal. This has had repercussions on the seller's current yacht, the 50m Codecasa Lady Ann Magee, also listed for sale by the same three brokerage houses. The owner has decided to keep her for the time being and she has now been withdrawn from the market.